According to Hindu mythology, Kali is said to have emanated from the brow of the goddess Durga. The text of the Devi-Mahatmyam (found in the Markandeya Purana, c. 300-600 C.E. 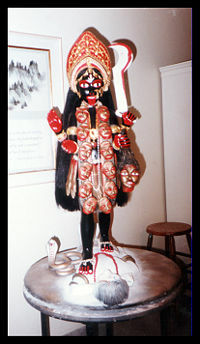 ), describes Kali as a slayer of demons during one of the battles between the divine and anti-divine forces. Her frightening imagery has been interpreted both symbolically, as a great protector from evil, and literally as the manifestation of shakti's force in the universe. She is also frequently associated with the powerful Hindu God Shiva. Kali is a feminine form of the Sanskrit word kala, meaning "time" and "black." Thus, her name can mean, "She who is time," "She who devours time," "She who is the Mother of time," "She who is black," and "She who is black time." 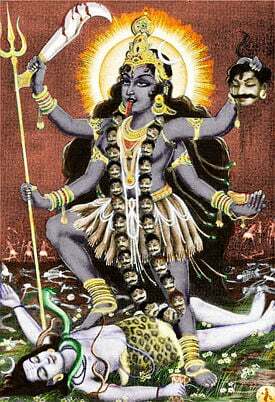 Kali's association with blackness stands in contrast to her consort, Shiva, who is white, like the ashes of the cremation ground (Sanskrit: śmaśan) in which he meditates, and with which they are both associated, hence Kali's epithet Śmaśanâ. Kali properly transliterated from Sanskrit is Kālī, which should not be confused with the common Sanskrit word properly transliterated as kali, meaning "terrible." They are grammatically unrelated, the first being nominal/ablative the latter adjectival. Frequent confusion comes in interpreting the kali yuga, or "terrible age," one of the four great ages (yugas) of Hindu cosmology, as conflated with the goddess Kali. This is mostly due to her appearance, which is often described as terrible and fearsome. In fact, the goddess Kali should not be confused with kali yuga, as her name holds separate and unrelated meaning. The name Kali first appears in the Rig Veda, not as that of a goddess, but as that of the black tongue of the seven flickering tongues of Agni, the Hindu god of fire. However, the prototype of the figure now known as Kali does appear, in the form of a goddess named Raatri. Raatri is considered to be the antecedent of both Durga and Kali. In the Sangam era of Tamilakam, a Kali-like bloodthirsty goddess named Kottravai appears in the literature of the period. Like Kali, she has disheveled hair, inspires fear in those who approach her and feasts on battlegrounds littered with the dead. It is quite likely that the fusion of the Sanskrit goddess Raatri and the indigenous Kottravai produced the fearsome goddesses of medieval Hinduism, amongst them Kali being the most prominent. It was the composition of the Puranas in late antiquity that firmly gave Kali a place in the Hindu pantheon. Kali or Kalika is described in the Devi-Mahatmyam (also known as the Chandi or the Durgasaptasati) from the Markandeya Purana, c. 300-600 C.E., where she is said to have emanated from the brow of the goddess Durga, a slayer of demons or avidya, during one of the battles between the divine and anti-divine forces. In this context, Kali is considered the 'forceful' form of the great goddess Durga. Another account of the origins of Kali is found in the Matsya Purana, c. 1500 C.E., which states that she originated as a mountain tribal goddess in the north-central part of India, in the region of Mount Kalanjara (now known as Kalinjar). However this account is disputed because the legend was of later origin. The sacred symbolism and philosophy accociated with Shiva-Shakti also led Kali to become an important Tantric figure. To the Tantric worshippers, it was just as essential to face Kali's curse, the terror of death, as willingly as they accepted blessings from her beautiful, nurturing, maternal aspect. For them, wisdom meant learning that no coin has only one side: as death cannot exist without life, so life cannot exist without death. Kali is given great metaphysical significance by some Tantric texts. The Nirvāna-tantra clearly presents her uncontrolled nature as the Ultimate Reality, claiming that the trimurti of Brahma, Vishnu and Shiva/Rudra arise and disappear from her like bubbles from the sea. The Yogini-tantra, Kamakhya-tantra and the Niruttara-tantra declare her to be the svarupa (own-being) of the Mahadevi (the great goddess). Thus, Kali is a goddess who appeals to many Hindus for different reasons. The iconography of Kali can be explained by studying the aesthetic formalities of the Nidanshastra—an authoritative collective on South Asian symbolism and plastic arts. Nothing is included in Hindu iconography without purpose. Starting with their various accompaniments, deities are usually portrayed holding objects in their hands and these objects always have some symbolic significance. The objects or icons that they hold can be roughly grouped into four categories: 1) weapons, 2) plant forms, 3) humans, animals and birds, and 4) everyday objects, like a book or a bowl. Some objects are generally carried by wrathful deities, while others are generally carried by peaceful deities. Some objects are traditionally masculine, while others are feminine. Finally, some objects are considered right-hand proper, while others are left-hand proper. Deities may hold their hands in a specific, ritualized gesture (known as mudra), or similarly, their legs may be in a ritual pose (asana). The body pose or bhanga can have special significance, as well as the throne or seat, vahana on which the deity rests. Even the dress of the deity can (and often does) have a particular meaning. Virtually, the whole visual ensemble—crown, ornamentation, garments, skin-pigmentation, etc.—have significance and can be a vital aid in the interpretation of the particular deity. Throughout India’s history, artists have portrayed Kali in a myriad of poses and settings (see images), some of which stray far from the popular description provided above, and are sometimes even graphically sexual in nature. Although there is often controversy surrounding these images of divine copulation, the general consensus is benign and free from any carnal impurities in its substance. In Tantra, the human body is a symbol for the microcosm of the universe; therefore sexual process is responsible for the creation of the world. Although theoretically Shiva and Kali (or Shakti) are inseparable, like fire and its power to burn, in the case of creation they are often seen has having separate roles. With Shiva as male and Kali as female it is only by their union that creation may transpire. This reminds us of the prakrti and purusha doctrine of Samkhya wherein vimarsa-prakasa has no practical value, just as without prakrti, purusa is quite inactive. This (once again) stresses the interdependencies of Shiva and Shakti and the vitality of their union. Given the popularity of this goddess, artists will likely continue to explore Kali’s iconography. Kali has four arms and hands. Two of these arms (usually the left) are holding a sword and a severed head. This signifies that in the end she will kill everyone—no one can avoid her as mortal death. The other two hands (usually the right) are in blessing, which means her initiated devotees (or anyone worshipping her with a true heart) will be saved as she will guide them to liberation. She wears a garland of 51 heads, which represents the Varnamala, or the “Garland of Letters.” This represents the 51 letters of the Devanagari or Sanskrit script. Hindus believe Sanskrit is a language of dynamism, and each of these letters represents a form of energy, or a form of Kali. Therefore she is generally seen as the mother of language, and all mantras. She is often depicted naked with Maya as her only covering and is shown as very dark, as she has no permanent qualities—she will continue to exist even when the universe ends. It is therefore believed that the concepts of color, light, good, bad do not apply to her—she is the pure, unmanifested energy, the Adi-shakti. Once Kali had destroyed all the demons in battle, she began a terrific dance out of the sheer joy of victory. All the worlds or lokas began to tremble and sway under the impact of her dance. So, at the request of all the Gods, Shiva himself asked her to desist from this behavior. However, she was too intoxicated to listen. Hence, Shiva lay like a corpse among the slain demons in order to absorb the shock of the dance into himself. When Kali eventually stepped upon her husband she realized her mistake and put out her tongue in shame. According to both the Mahanirvana and Kularnava Tantras, there are two distinct ways of perceiving the same absolute reality. The first is a transcendental plane that is often described as static, yet infinite. It is here that there is no matter; there is no universe and only consciousness exists. This form of reality is known as Shiva, the Absolute Sat-Chit-Ananda—existence, knowledge and bliss. The second is an active plane, an immanent plane, the plane of matter, of Maya, i.e., where the illusion of space-time and the appearance of an actual universe does exist. This form of reality is known as Kali or Shakti, and (in its entirety) is still specified as the same Absolute Sat-Chit-Ananda. It is here in this second plane that the universe (as we commonly know it) is experienced and is described by the Tantric seer as the play of Shakti, or the goddess as Mother Kali. From a Tantric perspective, when one meditates on reality at rest, as absolute pure consciousness (without the activities of creation, preservation or dissolution) one refers to this as Shiva, or Brahman. When one meditates on reality as dynamic and creative, as the Absolute content of pure consciousness (with all the activities of creation, preservation or dissolution) one refers to it as Kali or Shakti. However, in either case the yogini or yogi is interested in one and the same reality—the only difference being in name and fluctuating aspects of appearance. It is this which is generally accepted as the meaning of Kali standing on the chest of Shiva. The Shiv tattava (“divine consciousness as Shiva”) is inactive, while the Shakti tattava (“divine energy as Kali”) is active. Shiva represents Brahman, the absolute pure consciousness that is beyond all names, forms and activities. Kali, on the other hand, represents Shakti, or creative power, behind all consciousness. She can never exist apart from Shiva or act independently of him, i.e., Shakti, all the matter/energy of the universe, is not distinct from Shiva, or Brahman, but is rather the dynamic power of Brahman. Kali's poor reputation in the West is often ascribed largely to the cult of the Thuggee, a group of indigenous South Asians (primarily centered near Kolkata, c. thirteenth-nineteenth century C.E.) who took the goddess Kali as their deity. Although much controversy surrounds their habits, it has been widely reported that the Thuggee robbed and murdered travelers as sacrifices to Kali. The group was eventually broken up by the occupying, British colonists. The common English word thug is derived from the association with the Thuggee. Many non-Hindus were introduced to Kali by way of the goddess appearing as a villain deity in the films Gunga Din, Help! and Indiana Jones and the Temple of Doom, thus promoting inaccurate stereotypes of this goddess. Bhattacharyya, N.N. History of the Sakta Religion. New Delhi: Munshiram Manoharlal Publishers Pvt. Ltd., 1974. Svoboda, Robert E. 1986. Aghora, at the left hand of God. Albuquerque, NM: Brotherhood of Life. ISBN 0914732218. All links retrieved April 10, 2018. SHARANYA: The Maa Batakali Cultural Mission, Inc. This page was last modified on 10 April 2018, at 19:02.